Naidu Bodapti has admired the pongamia tree's unique resilience and multiple uses since his childhood. He has a unique understanding of the tree’s attributes that inspired him to launch a research program on its development over the past two decades. 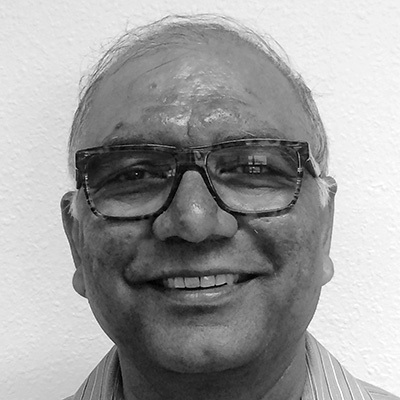 Naidu is an expert in physiology and molecular biology of Australian native trees, including pongamia and melaleuca. He has worked as a Senior Scientist in CSIRO Australia, Associate Professor at the University of Queensland, held senior positions in Queensland Government and as a CEO in private industry. He has authored more than 50 scientific publications and seven international patents on topics such as alleviation of stress in crops using novel biochemical compounds, which he discovered in Australian native trees, and on identification of elite cultivars of pongamia. Naidu earned his PhD in Plant Stress Physiology and Molecular Biology from the Waite Agricultural Research Institute, The University of Adelaide, Australia. He graduated top of his class for both an MS in Agronomy and a BS in Agriculture from A.P. Ag. University, India. He is a highly dedicated community worker and self-described toy poodle enthusiast who loves the company of his wife, three children and two grandchildren.